PLEASE COME VISIT OUR FULL RETAIL GREENHOUSE NURSERY IN SPARTANBURG, SOUTH CAROLINA! YOU WILL FIND IT IS WORTH THE TRIP! 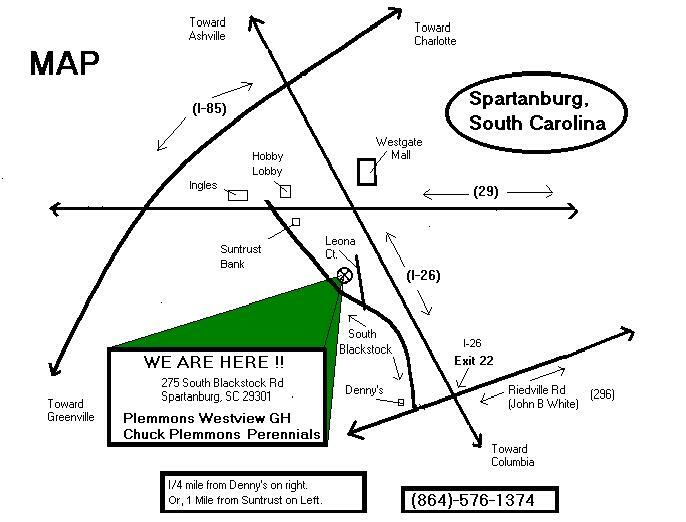 Chuck Plemmons Perennials (HOSTAMAN.COM) and Plemmons Westview Greenhouses are located together in Spartanburg, South Carolina! While we offer a wide selection of Hosta, we are a full retail establishement that also offers an extensive line of other Sun & Shade Perennials, as well as some Shrubs and Trees. In addition, Plemmons Greenhouses offers a full line of Annuals & Baskets, and a fine line of Vegatable Plants in Season. As large as our Hosta selection is, it is still only a small portion of what is available at our sales location. We have a Master Gardener (Kim) on site during the season to help with your gardening questions and plant selections. At our retail site we accept the following forms of payment: Cash, Check (with picture ID), Master Card, and Visa. The current pupose of our website is to allow customers to quickly view and print a copy of our current Hosta Catalog, which is a list of Hostas available at our retail location. All items sold at our retail location are grown & sold in pots! Varieties do sometimes sell out... so not all of the varieties listed are available 100 percent of the time ( but most are!) Weather, etc can also impact the exact availability. If you are coming for a specific Hosta in the catalog you may want to contact Kim to make sure it is available for you to purchase. Limited Numbers of other Hosta varieties also become available in season that may not be listed in the Hosta Catalog!